The summer school is aimed primarily at Ph. D. students and early career researchers from academia and beyond (e.g. industry, policy), regardless of disciplinary background or specialism. Social simulation is an inherently interdisciplinary activity that thrives on collaborations among experts from various domains. A maximum of 30 participants will be accepted. They will be working in small teams, with the task of delivering a working agent-based model by the end of the week. The model will address a research question identified at the beginning of the summer school. 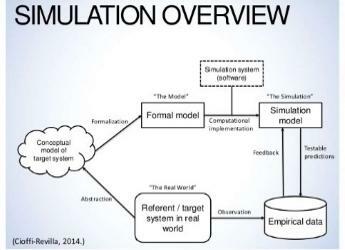 Gary Polhill is the current president of the European Social Simulation Association and has been working on various projects using agent-based modelling for over twenty years. Jiaqi Ge has a background in economics and did a PhD modelling housing bubbles with Leigh Tesfatsion (Iowa State) before joining the James Hutton Institute in 2014. Tony Craig is an environmental psychologist who has been collaborating with agent-based modellers for ten years or so in various international and interdisciplinary projects. Matt Hare has extensive experience in academia and as a consultant on participatory modelling for environmental resource management. He is an advisory board member of The International Assessment Society. Doug Salt has a background in industry as a professional computer scientist. He studied for a PhD in ontologies before joining the James Hutton Institute in 2016 to work on an EU project. Thomas French, Sandtable, UK. Thomas French is CTO of Sandtable, an agent-based modelling company in London, where he focuses on developing Sandman (sandman.ai) – a cloud-based platform for scalable, agile agent-based modelling. Before Sandtable, he completed a PhD in Informatics at the University of Edinburgh where he worked on simulation optimisation problems. The theme of the summer school is agent-based modelling of human-environment interactions. This emphasizes a key strength of agent-based modelling: its ability to bring together social and environmental dynamics in tightly coupled models, offering system-level insights that other approaches struggle to achieve. It also highlights that agent-based modelling is an inherently cross-disciplinary activity, and frequently takes on an integrative role in inter- and trans-disciplinary research projects. For this reason, there is a strong emphasis on collaborative work in ESSA summer schools. An open access article outlining our strategy for agent-based modelling at the Institute is available at https://tinyurl.com/abm-tubemap. The course will comprise a mix of lectures, guest talks, and individual and collaborative work, and will run the full week from Monday through Friday. A provisional programme is outlined below. Yellow shaded cells represent lectures, blue individual lab work, green group lab work. Fees for the summer school are £450 for registered students; £550 otherwise. Lunches and two evening meals are included. Located in Aberdeen’s west end, the Institute’s site at Craigiebuckler sits in beautiful grounds dating back to 1826, when the mansion house (now part of the Institute’s buildings) was built as a summer residence by James Blaikie, the first Lord Provost of Aberdeen. The grounds contain a number of trees from all over the world, as was fashionable during the Victorian era, which the Institute still maintains. The estate was bought by Thomas Bassett Macaulay in the 1930s, on behalf of the newly formed Macaulay Institute for Soil Research, which had the remit of improving the productivity of Scottish agriculture. In 1987, MISR was merged with the Hill Farming Research Organisation (HFRO) in Edinburgh, to create the Macaulay Land Use Research Institute, which itself merged with the Scottish Crop Research Institute in Dundee to form the James Hutton Institute in 2011. Aberdeen has a Youth Hostel approximately 2.5km from the Craigiebuckler site with rooms around £40 per night. We have a small number of self-catering rooms at our Craigiebuckler site. These will be offered on a first-come, first-served basis. By car: Use our post-code AB15 8QH in your sat-nav. By train: Our nearest railway station is Aberdeen. See https://www.nationalrail.co.uk/ for trains and timetables. By bus: Our nearest bus stop is ‘Craigebuckler’, which is on route 15. See https://www.firstgroup.com/aberdeen for details. The ESSA Summer School 2019 has been sponsored by Sandtable.